DLNA is a rather neat technology which greatly simplifies the way you access media content on your network. In real-world terms, it means that you can effortlessly access photos and videos stored on your DLNA-enabled Android device from your desktop machine, or stream videos from a DLNA-compatible digital media server to your laptop. But to experience the joys of DLNA on Linux, you need a DLNA client like eezUPnP. This nifty little utility lets you access and stream media content stored on DLNA-enabled devices with a minimum of fuss. eezUPnP is written in Java, so you need a Java Runtime Environment installed on your system to be able to run the application. To deploy eezUPnP, grab the latest release of the application from the project's website and unpack the downloaded archive. Switch then to the resulting directory in the terminal and launch eezUPnP by executing the ./CP command. eezUPnP automatically displays all discovered DLNA-compatible devices on your network. Select then the server you want and you can browse its contents in the left pane. 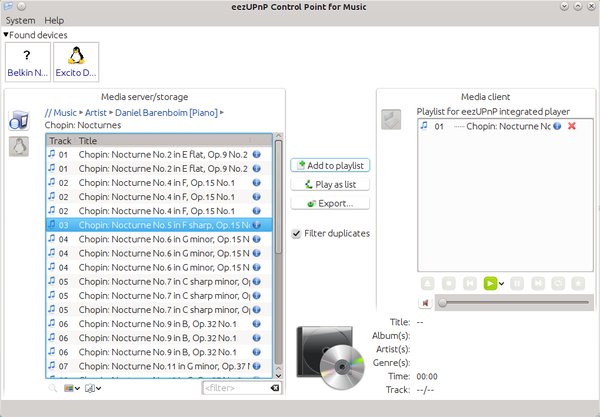 eezUPnP features a built-in player which can come in handy when you want to stream media files. And using the Export button, you can transfer files from the server to your machine. That's pretty much all there is to it. eezUPnP is undeniably bare-bones, but it does a commendable job of handling DLNA-compatible devices.